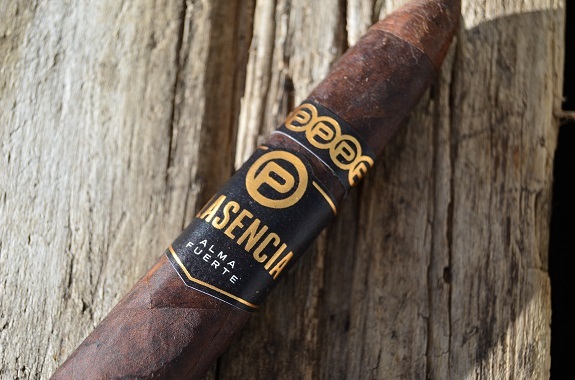 Plasencia is a well-known name in the cigar industry and one of the largest growers of premium tobaccos. Cigar giants and up-and-comings shop the large reserves and selection of Plasencia grown tobacco. And with a name so well known, it is hard to believe that it wasn’t until 2016 that Plasencia 1865, their own distribution company, was formed. Alongside the news of the distribution company, they also announced the development of several new brands under the Plasencia 1865 umbrella. One of which being the Plasencia Alma Fuerte. Part of the Alma series that includes Alma del Camp, Alma del Rio, Alma del Fuego, and Alma del Cielo, the Alma Fuetre is manufactured in Esteli, Nicaragua at the Plasencia factory. Ranging in price from $20-$22, the Alma Fuerte is available in three formats: Nestor IV (6 1/4 by 54 box-pressed), Generacion V (7 by 58 box-pressed salomon), and Sixto ii (6 by 60 hexagonally pressed). 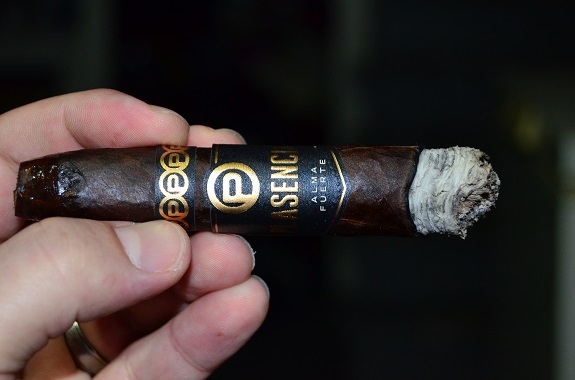 You can purchase the Plasencia Alma Fuerte from our good friends at Cuenca Cigars in their 2017 Top 10 Cigars by Cigar Aficionado sampler. 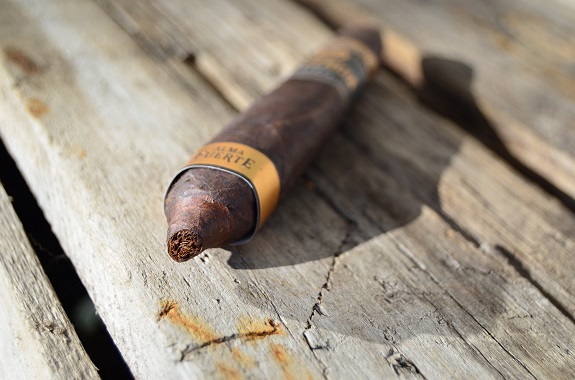 The Plasencia Alma Fuerte is cloaked in a crazy dark, nearly black wrapper. 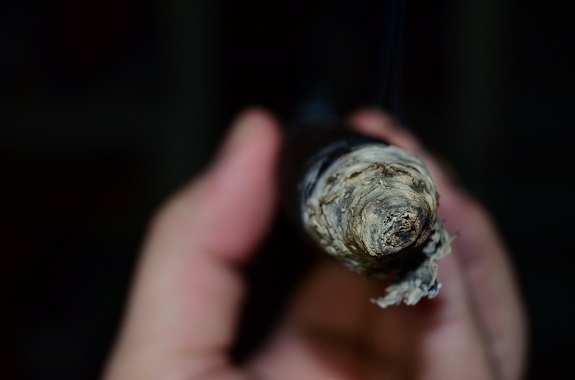 A heavy amount of veins and bumps are on the leaf and an oily sheen can be seen on the cigar that is rolled well with no soft spots. There is only a light woodsy aroma on the Plasencia Alma Fuerte and I am unable to pick anything from the nippled foot. The cold draw is surprisingly free as notes of cedar, clove, and a cinnamon spice lingers in the mouth. 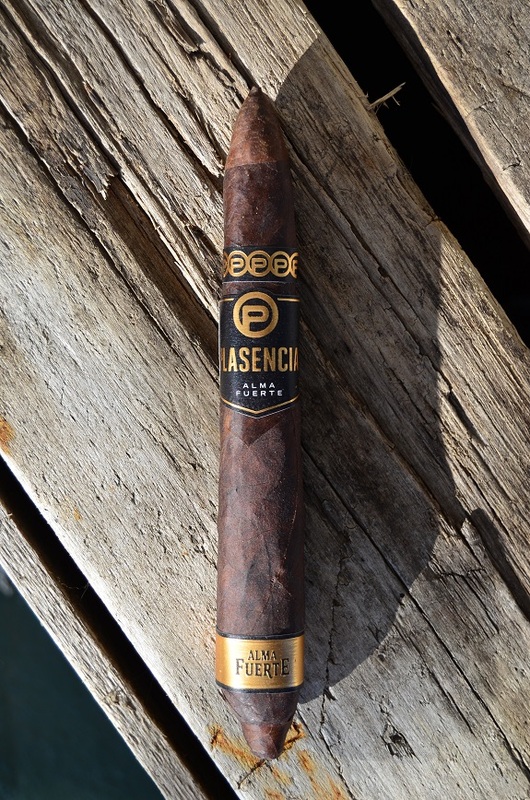 The Plasencia Alma Fuerte comes out rocking with full flavors, spice, and strength. 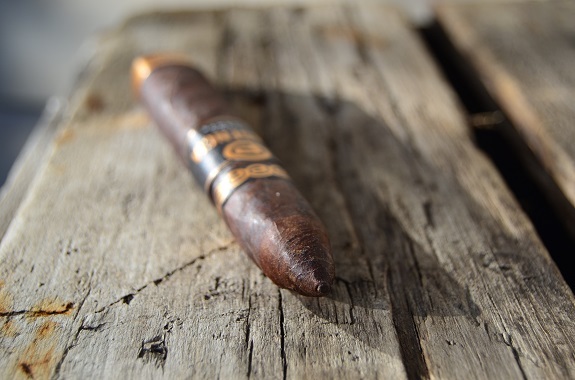 Smoke is pumping out of this large cigar, delivering flavors of pine, charred wood, and coffee. A faint sweetness makes its way into the profile and a pepper spice is keeping pace. The burn line is jagged, which seems to be a pretty consistent factor at the start of salomon shaped cigars. And even though the ash is flaky it holds well. The flavors of the Alma Fuerte settles as the strength remains steady. The pepper flavor is now the most dominant flavor, followed by the coffee. 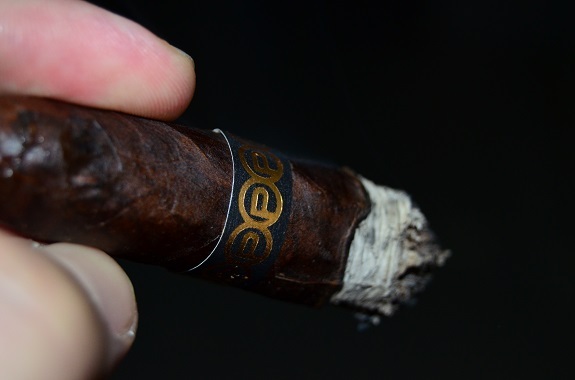 The pine has shifted to just a generic woodsy flavor on the finish of the smoke and a cocoa joins the profile as I near the middle of the cigar. As big as the pepper flavor is in the mouth, the retro-hale is very manageable. As I make my way into the last third, the Plasencia Alma Fuerte develops in richness and the sweetness that was off in the background in the first third has pushed its way forward. The coffee continues to hold its ground. A touch-up is finally required in the last couple of inches. The Plasencia Alma Fuerte carries an ultra-premium price tag at $22.00. So does the experience justify the price? For nearly two hours, the Alma Fuerte provides dark and rich flavors that move from full and settle in the medium range, while the strength is full and holds steadily throughout. At times, I found the strength to have an edge on the flavors. Smoked moved through the cigar easily right from the get-go. The only downsides construction wise were the uneven burn and flaky ash. The cigar is way out of my ballpark for weekly smokes, but, when the right occasion presents itself and I am looking for a 2-hour, full strength cigar, I certainly wouldn’t mind reaching for the Alma Fuerte. But for the coolness factor, I think I will grab the hexagonally pressed Sixto ii.